Chocolate, in all of its varied forms (candy bars, cocoa, cakes, cookies, coating for other candies and fruits) is probably America's favorite confection. With an annual per capita consumption of around 14 pounds (6 kilograms) per person, chocolate is as ubiquitous as a non-essential food can be. Cocoa trees originated in South America's river valleys, and, by the seventh century A.D., the Mayan Indians had brought them north into Mexico. In addition to the Mayans, many other Central American Indians, including the Aztecs and the Toltecs, seem to have cultivated cocoa trees, and the words "chocolate" and "cocoa" both derive from the Aztec language. When Cortez, Pizarro, and other Spanish explorers arrived in Central America in the fifteenth century, they noted that cocoa beans were used as currency and that the upper class of the native populations drank cacahuatl, a frothy beverage consisting of roasted cocoa beans blended with red pepper, vanilla, and water. While the Spanish initially found the bitter flavor of unsweetened cacahuatl unpalatable, they gradually introduced modifications that rendered the drink more appealing to the European palate. Grinding sugar, cinnamon, cloves, anise, almonds, hazelnuts, vanilla, orange-flower water, and musk with dried cocoa beans, they heated the mixture to create a paste (as with many popular recipes today, variations were common). They then smoothed this paste on the broad, flat leaves of the plantain tree, let it harden, and removed the resulting slabs of chocolate. To make chocalatl, the direct ancestor of our hot chocolate, they dissolved these tablets in hot water and a thin corn broth. They then stirred the liquid until it frothed, perhaps to distribute the fats from the chocolate paste evenly (cocoa beans comprise more than fifty percent cocoa butter by weight). By the mid-seventeenth century, an English missionary reported that only members of Mexico's lower classes still drank cacahuatl in its original form. When missionaries and explorers returned to Spain with the drink, they encountered resistance from the powerful Catholic Church, which argued that the beverage, contaminated by its heathen origins, was bound to corrupt Christians who drank it. But the praise of returning conquistadors—Cortez himself designated chocalatl as "the divine drink that builds up resistance and fights fatigue"—overshadowed the church's dour prophecies, and hot chocolate became an immediate success in Spain. Near the end of the sixteenth century, the country built the first chocolate factories, in which cocoa beans were ground into a paste that could later be mixed with water. Within seventy years the drink was prized throughout Europe, its spread furthered by a radical drop in the price of sugar between 1640 and 1680 (the increased availability of the sweetener enhanced the popularity of coffee as well). Chocolate consumption soon extended to England, where the drink was served in "chocolate houses," upscale versions of the coffee houses that had sprung up in London during the 1600s. In the mid-seventeenth century, milk chocolate was invented by an Englishman, Sir Hans Sloane, who had lived on the island of Jamaica for many years, observing the Jamaicans' extensive use of chocolate. A naturalist and personal physician to Queen Anne, Sloane had previously considered the cocoa bean's high fat content a problem, but, after observing how young Jamaicans seemed to thrive on both cocoa products and milk, he began to advocate dissolving chocolate tablets in milk rather than water. The first Europeans to drink chocolate, the Spaniards were also the first to consume it in solid form. Although several naturalists and physicians who had traveled extensively in the Americas had noted that some Indians ate solid chocolate lozenges, many Europeans believed that consuming chocolate in this form would create internal obstructions. As this conviction gradually diminished, cook-books began to include recipes for chocolate candy. However, a typical eighteenth-century hard chocolate differed substantially from modern chocolate confections. Back then, chocolate candy consisted solely of chocolate paste and sugar held together with plant gums. In addition to being unappealing on its own, the coarse, crumbly texture of this product reduced its ability to hold sugar. Primitive hard chocolate, not surprisingly, was nowhere near as popular as today's improved varieties. These textural problems were solved in 1828, when a Dutch chocolate maker named Conrad van Houten invented a screw press that could be used to squeeze most of the butter out of cocoa beans. Van Houten's press contributed to the refinement of chocolate by permitting the separation of cocoa beans into cocoa powder and cocoa butter. Dissolved in hot liquid, the powder created a beverage far more palatable than previous chocolate drinks, which were much like blocks of unsweetened baker's chocolate melted in fluid. Blended with regular ground cocoa beans, the cocoa butter made chocolate paste smoother and easier to blend with sugar. Less than twenty years later, an English company introduced the first commercially prepared hard chocolate. In 1876 a Swiss candy maker named Daniel Peter further refined chocolate production, using the dried milk recently invented by the Nestle company to make solid milk chocolate. In 1913 Jules Sechaud, a countryman of Peter's, developed a technique for making chocolate shells filled with other confections. Well before the first World War, chocolate had become one of the most popular confections, though it was still quite expensive. Hershey Foods, one of a number of American chocolate-making companies founded during the nineteenth and early twentieth centuries, made chocolate more affordable and available. Today the most famous—although not the largest—chocolate producer in the United States, the company was founded by Milton Hershey, who invested the fortune he'd amassed making caramels in a Pennsylvania chocolate factory. Hershey had first become fascinated by chocolate at the 1893 Chicago World's Columbian Exposition, where one of leading attractions was a 2,200-pound (998.8 kilograms), ten-foot (3.05 meters) tall chocolate statue of Germania, the symbol of the Stollwerck chocolate company in Germany (Germania was housed in a 38-foot [11.58 meters] Renaissance temple, also constructed entirely of chocolate). When he turned to chocolate making, Hershey decided to use the same fresh milk that had made his caramels so flavorful. He also dedicated himself to utilizing mass production techniques that would enable him to sell large quantities of chocolate, individually wrapped and affordably priced. For decades after Hershey began manufacturing them in 1904, Hershey bars cost only a nickel. Another company, M&M/Mars, has branched out to produce dozens of non-chocolate products, thus making the company four times as large as Hershey Foods, despite the fact that the latter firm remains synonymous with chocolate in the eyes of many American consumers. Yet since its founding in 1922, M&M/Mars has produced many of the country's most enduringly popular chocolate confections. M&M/Mars' success began with the Milky Way bar, which was cheaper to produce than pure chocolate because its malt flavor derived from nougat, a mixture of egg whites and corn syrup. The Snickers and Three Musketeers bars, both of which also featured cost-cutting nougat centers, soon followed, and during the 1930s soldiers fighting in the Spanish Civil War suggested the M&M. To prevent the chocolate candy they carried in their pockets from melting, these soldiers had protected it with a sugary coating that the Mars company adapted to create its most popular product. Although other ingredients are added, most notably sugar or other sweeteners, flavoring agents, and sometimes potassium carbonate (the agent used to make so-called dutch cocoa), cocoa beans are the primary component of chocolate. Cocoa trees are evergreens that do best within 20 degrees of the equator, at altitudes of between 100 (30.48 centimeters) and 1,000 (304.8 centimeters) feet above sea level. Native to South and Central America, the trees are currently grown on commercial plantations in such places as Malaysia, Brazil, Ecuador, and West Africa. West Africa currently produces nearly three quarters of the world's 75,000 ton annual cocoa bean crop, while Brazil is the largest producer in the Western Hemisphere. Because they are relatively delicate, the trees can be harmed by full sun, fungi, and insect pests. To minimize such damage, they are usually planted with other trees such as rubber or banana. The other crops afford protection from the sun and provide plantation owners with an alternative income if the cocoa trees fail. The pods, the fruit of the cocoa tree, are 6-10 inches (15.24-25.4 centimeters) long and 3-4 inches (7.62-10.16 centimeters) in diameter. Most trees bear only about 30 to 40 pods, each of which contains between 20 and 40 inch-long (2.54 centimeters) beans in a gummy liquid. The pods ripen in three to four months, and, because of the even climate in which the trees grow, they ripen continually throughout the year. However, the greatest number of pods are harvested between May and December. Of the 30 to 40 pods on a typical cacao tree, no more than half will be mature at any given time. Only the mature fruits can be harvested, as only they will produce top quality ingredients. After being cut from the trees with machetes or knives mounted on poles (the trees are too delicate to be climbed), mature pods are opened on the plantation with a large knife or machete. The beans inside are then manually removed. Still entwined with pulp from the pods, the seeds are piled on the ground, where they are allowed to heat beneath the sun for several days (some plantations also dry the beans mechanically, if necessary). Enzymes from the pulp combine with wild, airborne yeasts to cause a small amount of fermentation that will make the final product even more appetizing. During the fermenting process, the beans reach a temperature of about 125 degrees Fahrenheit (51 degrees Celsius). This kills the embryos, preventing the beans from sprouting while in transit; it also stimulates decomposition of the beans' cell walls. Once the beans have sufficiently fermented, they will be stripped of the remaining pulp and dried. Next, they are graded and bagged in sacks weighing from 130 to 200 pounds (59.02-90.8 kilograms). They will then be stored until they are inspected, after which they will be shipped to an auction to be sold to chocolate makers. 1 Once a company has received a shipment of cocoa beans at its processing plant, the beans are roasted, first on screens and then in revolving cylinders through which heated air is blown. Over a period of 30 minutes to 2 hours, the moisture in the beans is reduced from about seven percent to about one percent. The roasting process triggers a browning reaction, in which more than 300 different chemicals present in the cocoa beans interact. The beans now begin to develop the rich flavor we associate with chocolate. 2 Roasting also causes the shells to open and break away from the nibs (the meat of the bean). This separation process can be completed by blowing air across the beans as they go through a giant winnowing machine called a cracker and fanner, which loosens the hulls from the beans without crushing them. The hulls, now separated from the nibs, are usually sold as either mulch or fertilizer. They are also sometimes used as a commercial boiler fuel. 3 Next, the roasted nibs undergo broyage, a process of crushing that takes place in a grinder made of revolving granite blocks. The design of the grinder may vary, but most resemble old-fashioned flour mills. The final product of this grinding process, made up of small particles of the nib suspended in oil, is a thick syrup known as chocolate liquor. In chocolate manufacture, the cocoa beans are first roasted, during which the bean shells break away from their center (the nibs). Next, the nibs undergo broyage, a crushing process that takes place in a grinder with revolving granite blocks. The following step, refining, further grinds the particles and makes the chocolate mass smoother. The mass is then conched, or ground and agitated in a huge open vats. During this process, which can take from 3 hours to 3 days, other ingredients such as sugar and vanilla can be added. The mass is then poured into molds of the desired shape, cooled, cut, and wrapped. 4 The next step is refining, during which the liquor is further ground between sets of revolving metal drums. Each successive rolling is faster than the preceding one because the liquor is becoming smoother and flows easier. The ultimate goal is to reduce the size of the particles in the liquor to about .001 inch (.00254 centimeters). 5 If the chocolate being produced is to be cocoa powder, from which hot chocolate and baking mixes are made, the chocolate liquor may be dutched, a process so-named because it was invented by the Dutch chocolate maker Conrad van Houten. In the dutching process, the liquor is treated with an alkaline solution, usually potassium carbonate, that raises its pH from 5.5 to 7 or 8. This increase darkens the color of the cocoa, renders its flavor more mild, and reduces the tendency of the nib particles to form clumps in the liquor. The powder that eventually ensues is called dutch cocoa. 6 The next step in making cocoa powder is defatting the chocolate liquor, or removing large amounts of butter from it. This is done by further compressing the liquor between rollers, until about half of the fat from its cocoa beans has been released. The resulting solid material, commonly called press cake, is then broken, chopped, or crushed before being sifted to produce cocoa powder. When additives such as sugar or other sweeteners have been blended, this cocoa powder becomes a modern version of chocalatl. 7 If the chocolate being produced is to become candy, the press cake is remixed with some of the removed cocoa butter. The restored cocoa butter is necessary for texture and consistency, and different types of chocolate require different amounts of cocoa butter. 8 The mixture now undergoes a process known as conching, in which it is continuously turned and ground in a huge open vat. The process's name derives from older vats, which resembled large conch shells. The conching process can last from between three hours to three days (more time is not necessarily better, however). This is the most important step in making chocolate. The speed and temperature of the mixing are critical in determining the quality of the final product. 9 Another crucial aspect of conching is the time and rate at which other ingredients are added. The ingredients added during conching determine what type of chocolate is produced: sweet chocolate consists of chocolate liquor, cocoa butter, sugar, and vanilla; milk chocolate contains sweet chocolate with powdered whole milk or whole liquid milk. 10 At the end of the conching process, the chocolate is poured into molds, cooled, cut, and wrapped. Proportions of ingredients and even some aspects of processing are carefully guarded secrets, although certain guidelines were set by the 1944 Federal Food, Drug, and Cosmetic Law, as well as more recent laws and regulations. For example, milk chocolate must contain a minimum of 12 percent milk solids and 10 percent chocolate liquor. Sweet chocolate, which contains no milk solids, must contain at least fifteen percent chocolate liquor. The major companies, however, have a reputation for enforcing strict quality and cleanliness standards. Milton Hershey zealously insisted upon fresh ingredients, and the Mars company boasts that its factory floors harbor fewer bacteria than the average kitchen sink. Moreover, slight imperfections are often enough to prompt the rejection of entire batches of candy. Although concerns about the high fat and caloric content of chocolate have reduced per capita consumption in the United States from over twenty pounds (9.08 kilograms) per year to around fourteen (6.36 kilograms), chocolate remains the most popular type of confection. In addition, several psychiatrists have recently speculated that, because the substance contains phenylethylamine, a natural stimulant, depressed people may resort to chocolate binges in an unknowing attempt to raise their spirits and adjust their body chemistry. Others have speculated that the substance exerts an amorous effect. Despite reduced levels of consumption and regardless of whether or not one endorses the various theories about its effects, chocolate seems guaranteed to remain what it has been throughout the twentieth century: a perennial American favorite. Chocolate Manufacturers' Association of the U.S.A. The Story of Chocolate. O'Neill, Catherine. Let's Visit a Chocolate Factory. Troll Associates, 1988. Cavendish, Richard. "The Sweet Smell of Success," History Today. July, 1990, pp. 2-3. "From Xocoatl to Chocolate Bars," Consumer Reports. November, 1986, pp. 696-701. Galvin, Ruth Mehrtens. "Sybaritic to Some, Sinful to Others, but How Sweet it Is!" Smithsonian. February, 1986, pp. 54-64. Marshall, Lydia and Ethel Weinberg. "A Fine Romance," Cosmopolitan. February, 1989, pp. 52-4. "between 100 (30.48 centimeters) and 1,000 (304.8 centimeters) feet above sea level." The statement should read "meters" in place of "centimeters." We did it differently on our plantation in Popondetta in Papua New Guinea. The raw cocoa beans were put in a series of very large wooden boxes. Each one held about a tonne. Here the fermentation process took place for 7 or so days. The beans were turned from one box into the next at regular intervals to evenly distribute air into the process and promnote complete fermentation. Following this process the beans were dried either in the sun on large wire racks or if the weather was wet in a wood fired drying shed. I am interesting in your product and please contact with me ! this was a very interesting artical! it helped me on my science project! thanks a bunch! your best friend in the world! How much cocoa powder can be made from raw cocoa beans? 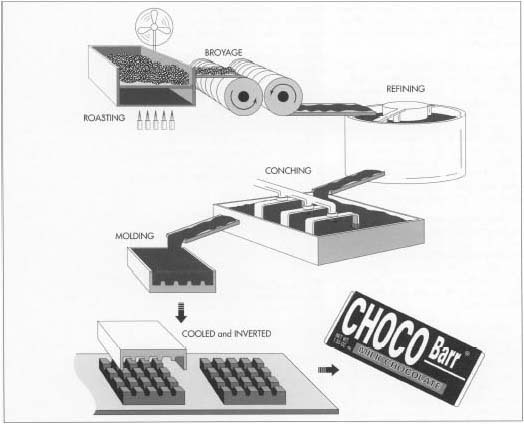 i am doing a project on chocolate, and i was wondering how people with out machines process the cocoa beans. thank you!!! Under RAW MATERIALS, check your meter-feet conversion!